· Smart Return to Home (RTH): Press this button when the drone in GPS mode will cause the drone to fly back to the starting point you set as take-off. Find your drone when you get it out of your sight. · Follow Me Mode: Follow the GPS on your smartphone, making sure your drone captures you with high precision wherever you go. 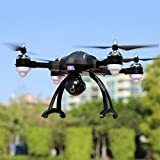 · FPV Transmission (First Person View) and HD 720P Wide Angle Optimized Camera: Full HD 720P Wi-Fi FPV camera works perfectly, allowing you to see what your drone sees, ideal for shooting a designated spot or just looking around. · Altitude Hold, Headless Mode, One-Key Take-Off / Landing and Emergency Stop - these features are perfect for beginners to fly the drone and reduce the learning curve.